The sun shone in a brilliant blue sky as Grantchester took the field for the first match at Spring Lane. The tinkle of ice in the Pimms and the popping of champagne corks provided the soundtrack to this historic occasion…………………. well, that’s what the script said. In reality a bone-chilling North Easterly scoured across the field and hot toddies would have been most spectators beverage of choice (Adnams being temporarily unavailable). Thermals would have been a good idea. At 1.00 the ground was officially opened by Richard Pemberton who has allowed us the use of the Spring Lane field and Adrian Frost whose generosity at the very start of this endeavour enabled us to begin work on the square. 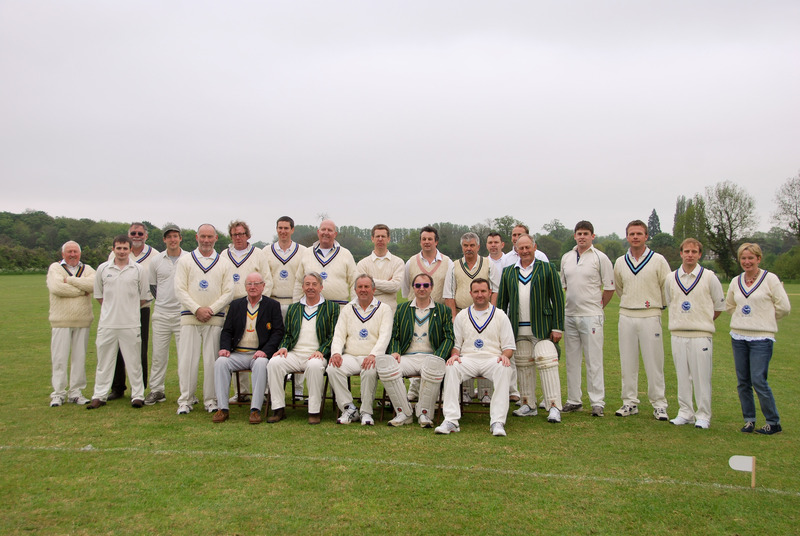 Ribbons were cut, glasses were raised, Captain Wilson won the toss, gave Conington first use and we were off! I think it’s fair to say that there were a few tears in the eyes as we took the field and the realisation that all the hours of work had been worthwhile sank in. Our friends from Conington got off to a slow start and after 3 overs the score was 3 for three, Tony Kennedy taking a blindingly good caught and bowled opportunity for the first wicket while at the other end Neil Woods had the other opener plumb LBW. The pitch, which had been the focus of so much loving care and attention over the previous weeks, was showing signs of Friday night’s heavy rain but although most deliveries kept low and the wicket was generally sluggish the ball came through with consistent bounce and some sunshine should will undoubtedly see further improvement in both pace and bounce. Harry Fordham was batting well – eventually scoring 67 – with valuable support from the middle order and halfway through their allotted 30 overs with the score at 78 for the loss of four wickets Conington were poised to accelerate. The phrase “catches win matches” is something of a cliché but the excellent catch Wizz took to dismiss Fordham was perhaps proof of this as the remainder of the Conington batsmen fell quickly. All out 110 in 26 overs. In all seven bowlers were used and the wickets shared between, Tony Kennedy (2), Neil Woods (1), Dave Foster (1), Jamie Innes (2), Adam Potter (1) and Sam Ludford (2). One of the features of last season was (generally) tight bowling and good fielding and we started this season where we left off. Some excellent catches were taken – Sam Ludford’s diving catch was exceptional – and the ground fielding committed; Will Bates in particular letting nothing past. Jerry “The Man with the Golden Spanner” Gregain had a fine game behind the stumps and the Conington score included only one (leg) bye. Matt Jones fast pick up and direct hit from the third man boundary was also noteworthy. A target of 111 looked comfortable despite the loss of Adam’s wicket in the second over (8 for one). At the other end Jamie Innes – making his debut – looked comfortable and seemingly had little trouble with the Conington bowling. Jamie’s eventual score of 67 not out included 12 fours and was scored off 68 balls. At the other end Tony Kennedy played one of his typically obdurate innings scoring mainly in singles until in the tenth over he smashed a straight six far over the boundary into the woods (nearly decapitating a walker into the bargain). When TK went – in the eleventh over – the score stood at 48 and the loss of another quick wicket could have changed the complexion of the game. Fortunately the Grantchester number 4 – Wizz – was more than equal to the task and he and Jamie saw Grantchester home with overs to spare (Wizz not out 15). Grantchester winning by 8 wickets. Thanks to all our friends and supporters, Ben for the fizz, the Kennedy clan for the excellent sandwiches, the Orchard Tea Rooms for (funnily enough) the tea, our hardy umpires, John and Karolin for the beer and everyone else who helped make Sunday 20th May a day to remember.